ASUS Transformer Mini T102HA-D4-GR Intel Atom x5-Z8350 (1.44 GHz) 4 GB Memory 128 GB eMMC 10.1"
I completely understand that not everyone has monster hands like me, and that a smaller 2-in-1 might be better suited to their computing needs. ASUS seems to agree, and the Transformer Mini T102H is proof that they’re listening. While it’s certainly not the most powerful 2-in-1 we’ve tested, this little guy has a few distinct features (other than the compact size) that set it apart from the competition. Let’s see if the Transformer Mini hits that sweet spot of performance, price, and size. 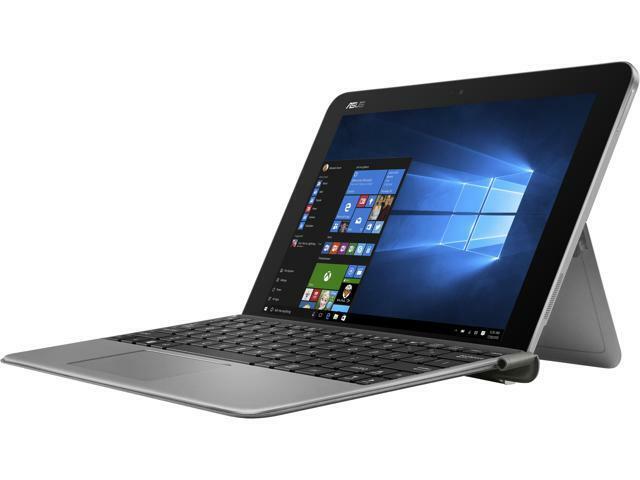 You can pick up the ASUS Transformer Mini for just $380, making it a great entry level 2-in-1. The defining characteristics of the Transformer Mini are the size and the building materials. It’s certainly on the smaller side, even for a 2-in-1, weighing in at just 1.76 lbs. (WITH the keyboard). The 10.1-inch screen and half-inch thickness really do give it ultra-portability. This would make an excellent addition to your purse or briefcase for those times when your phone just isn’t enough, but you don’t want to lug an entire laptop around. But for something that’s going to do a lot of traveling, it needs to be tough. Fortunately, the build quality on the Transformer Mini is pretty stellar. The tablet is made from a magnesium aluminum alloy, and even the stand that flips out from the back is premium metal. The keyboard is a different story (more on that in a second), but it acts primarily as a cover for the screen when it’s closed, and for that it does the job. The Transformer Mini is definitely portable, that’s one box that can be easily checked off. Of course, it doesn’t matter how portable something is if it doesn’t work. So how does the Transformer Mini perform? The short answer is, it depends. As far as a tablet itself goes, the performance is all around stellar. The 10.1-inch screen runs at 1280 x 800 and 60Hz, and looks as great as you could expect at that resolution. It really feels and looks exceptional – the tablet is light, the metal feels great, and the touchscreen is remarkably responsive. Even the transition between landscape and portrait is faster than most of the competition. The metal kickstand is a little difficult to pull out, but once it’s out it feels solid and allows you to view the tablet at virtually any angle. There’s even a fingerprint sensor on the back for those who are security minded, and surprisingly decent speakers given the size. The polymer battery life is also pretty solid. ASUS claims it gets 11 hours on one charge, and though we didn’t get quite that high, getting a full day’s use out of it should be no problem. All in all, the Transformer Mini is an excellent Windows 10 tablet, and I’d have no trouble recommending it as is. But, this is a 2-in-1, which means it’s time to talk about that keyboard. The first thing people said when I handed them the keyboard and asked them to type was “Cute!” And cute it is. It comes in a variety of colors allowing for customization, and it was clearly designed to appeal to people who like colorful little things. The truth is, I’m probably not the target demographic for this particular model. It’s simply too small for me to use comfortably. The keys are shallow and close together, with a 1.5mm key travel. I really do have large fingers, so I struggled with typing on this keyboard. That being said, it’s not really ASUS’s fault that the keyboard is so small. It’s a small tablet, so there’s really no way around the space constraints. It should be mentioned that one of my coworkers has smaller hands, and she quite liked typing on it. So whether you like using it will likely depend on the size of your hands. At the end of the day, the keyboard and trackpad are functional, but the smaller size should be kept in mind. It’s got cute colors so, like, that’s pretty cool…but I’m going to stick to tablet mode. The Transformer Mini is a detachable 2-in-1, despite the name implying that it’s transformable. Who knew? That means the tablet section completely detaches from the keyboard, as opposed to fully rotating backwards and remaining connected. The Transformer Mini is connected via magnet and six pins, meaning that to disconnect you basically just pull it off. It’s not the most elegant solution, but the magnets are strong enough that you’re probably not going to accidentally detach it, and it reattaches very quickly and easily. The reattachment is almost instantaneous, so you can go from tablet mode to using the keyboard with remarkable speed. Our Transformer Mini came with a stylus, and I had a lot of fun playing with it. It’s a bit larger than you might expect given the size of the tablet, but it works well, and transitioning from drawing to right clicking was intuitive and easy to figure it out. It does attach magnetically to the back of the Transformer and, as is so common with magnetically attached peripherals, it’s pretty easy to knock it off and lose it. There’s a cloth loop included to easily grasp the keyboard, and I’m curious why they didn’t simply make it bigger and allow the stylus to rest in there. Not a big deal though, and the inclusion of the stylus is a nice touch. One area in which the Transformer Mini is a bit lacking is the hardware department. It’s not trying to compete with a gaming laptop in function or price, and what’s in there is more than capable of handling a light 2-in-1 workload. But in a market where the competition is going with lots of RAM and 7th Gen Intel CPUs, it’s a bit disappointing. The Transformer Mini has 4GB of DDR3 RAM, and a 128 GB SSD. That’s not exactly top of the line, but with the option of expanding your memory via Mini SD card it’s certainly manageable. The CPU is an Intel Atom X5 running at 1.44GHz, so you won’t be rendering in 4K, but for the vast majority of tasks you would expect to accomplish on a 2-in-1, this should be sufficient. Again, keep in mind the very low cost of this 2-in-1 and it starts to make sense. Another way in which the Transformer is much more a tablet than a laptop is the limited I/O port options. The Transformer Mini is not vying to replace your expensive rig – it’s meant to be a portable, adorable little mini computer, and for that it hits all the marks. There is a full size USB port, which is critical, because you’re definitely going to want an external keyboard if you want to do any serious typing. There’s also the aforementioned mini SD expansion slot, which is very cool, and a mini HDMI output for connecting to external displays. The tablet is charged with a standard micro USB cable, which is great because you probably already have ten lying around. That’s all there is, however, which definitely puts it in tablet not laptop replacement territory. That being said, the Transformer Mini is not vying to replace your expensive rig – it’s meant to be a portable, adorable little mini computer, and for that it hits all the marks. It may not be a powerhouse, but for the right person it might be the perfect combination of size, look, price, and performance. The included keyboard and stylus are just a bonus for a pretty great tablet. Check it out.